Humans spend roughly one-third of their lives asleep. It sounds like a waste of time until you realize how important sleep is to our health. With this in mind, the money you spend on a quality bed is worth every penny. Purchasing the best foam mattress possible and fitting it with top-notch bedding will help keep you well-rested and full of energy throughout the day. What’s more, a better-made bed will maintain its comfort level for longer than something fetched at the nearest home decor outlet store. The automobile makes and models known for their dependability tend to be priced a few thousand more than comparable ones which lack such prestige. This drives many frugal-minded men and women to opt for the cheaper and less dependable options, but the short-term savings are unlikely to outweigh the long-term costs. By choosing to spend extra at the point of purchase, folks are able to avoid spending thousands more down the road for car repairs and replacement parts. The average person will likely walk over 100,000 miles in the course of his or her lifetime. Even if you count among the least active among the greater population, you’re undoubtedly spending a significant amount of time on your feet. Given this fact, investing in quality footwear is a wise way to spend your hard-earned money. Miles of walking in poorly made shoes and sandals will lead to mounting aches and pains which often transform into expensive medical bills. Not to mention, most discount footwear falls apart after a few months of daily wear. It all adds up to justify the extra $50 spent on a durable pair of shoes. Whether it’s the blender in the kitchen or the washing machine in the basement, you want your home appliances to work right every time. In order to achieve this rate of success, it’s imperative to avoid buying the cheapest models available for purchase. It doesn’t mean you need to buy the most expensive options on the market, but rather do your research to ensure the brand is known for reliability and customer satisfaction. 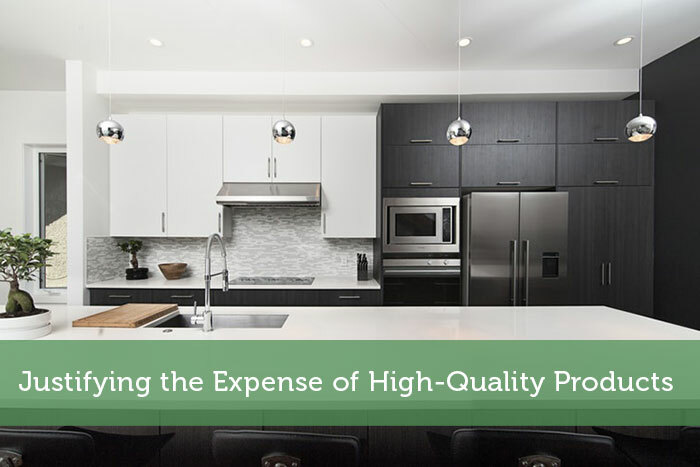 If the only options that meet these criteria are the ones which are priced mid-to-high, your willingness to spend more now will pay off when your appliances are still working a decade from now. The same approach to appliances should be taken with any equipment you purchase, whether it’s for a hobby or for your profession. Having a “buy it for life” mentality when shopping around for cameras, power tools, and similar products will help soften the sticker shock you get when seeing how much the good stuff actually costs. As is the case with everything else on this list, a front-end decision to spend more is likely to result in avoiding the need to replace your equipment every few years. Those who are smart with money are good at not buying things they don’t need and bargain hunting for the things they do. However, as life goes on and you start to see your low-cost products crapping out faster than the nicer stuff you bought, it starts to make sense to spend a little extra on quality.